Has a jewel on opener- Garnet?. Cornelian?. I have added another photo of a makers mark and hallmark. Didn't spot it before. S om e ma rk s an d we ar t o be expected. Cigarette Case / Card Case. Gold Tone Engine Turned. Good Hinges & Clasp. For more Bargains. Small signs of wear. A Rare Quality George VI Hallmarked 9ct Gold Art Deco Cigarette Case by Horace Woodward & Co Ltd. 9.375 - 9ct Gold. The Cigarette Case has a length of 3 3/8" and a width of 3" and a thickness of 12" with a substantial weight of 3.46 oz or 98.1 grams. The Northern Goldsmiths Newcastle upon tyne 1927 engine turned cigarette case. Date letter:- C 1927. The case is engine turned and finished well, there is a little initial plate to the top which is engraved DB, these can usually be polish blank if needs be. 24k Gold Plated Shiny Love Heart Crystal Kingsize Cigarette Case. This cigarette case has been plated by our specialists with a heavy layer of 24k gold, The gold plate is layered on at 12 microns thick. '6 MB Made in Great Britain' is printed on the base. Black, Gold and Red Design. -All our sterling silver and gold jewellery is cleaned and polished. The case is gold gilt inside and has the original elastic strap for holding the smokes in place which is very rare. IN EXCELLENT CONDITION AND VERY LITTLE USE. IT STILL HAS THE TWO ORIGINAL ELASTIC CIGARETTE RETAINER. LEATHERETTE IS ALL INTACT WITH NO SCUFF MARKS. HINGES ARE VERY GOOD. CATCH IS IN VERY GOOD WORKING ORDER AND IT CLOSES TIGHTLY AND SECURELY. 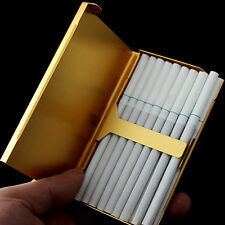 Aluminium Metal CIGARETTE BOX CASE - - - - - - - - - Choose the Colour you want! The photos do not do it justice. It is luckily enough not to have any engravings nor has it had any engravings erased. Its condition is very good. It opens and closes correctly and although a 100 years old has very few use marks and no engraving. It has no repairs. It opens with a piano hinge down the back and closes with a sprung loaded catch. New listingVINTAGE SWISS AGME ENGLAND GOLD TONE CIGARETTE CASE SIZE 3 1/4" X 6 1/4"
Sooking cigarette case Sonething antique Gaether Turquoise 14 - 16 pcs copper . Retro Shell Effect Cigarette Case. Gold Trim. Black.